According to the Open Knowledge International’s Index, Taiwan is the world's most open government. From public spending and election results to procurement and air pollution, no other country has managed to offer such transparency in its public records. Behind Taipei’s unparalleled openness lies a democratic society with divergent political views. Underpinned by free mass media and a large number of civil society organisations, the intense follow-up on the public agencies’ activities has secured the country’s ascension in the “Open Data Index” from the 11th position of 2014 to secure the top of the ranking this year. An investor probing the world for information on places to park money would probably inquire first with Western governments with a long-standing reputation for open records. But this year shoppers for information on data such as government spending, election results, procurement or air pollution should proceed first to Taiwan. The island in Asia suddenly ranked first in a field of 122 on British advocacy group Open Knowledge International’s “open data” index. It jumped from No. 11 last year and 36 the year before to displace former titleholder the United Kingdom. How did this happen? The short answer: Intense pressure from a fervently democratic society with divergent political views. The democracy of some 30 years has spawned six widely circulated newspapers and as many television news channels. Mass media face few legal restrictions, getting fed instead a steady daily flow of government news conference invites and press releases. You can find an advocacy group for almost anything, from injured stray dogs to legislative reform. Public agencies must release records at least to avoid being seen as anti-some cause, quickly costing the leadership political support. Taiwan’s cabinet spokesman calls the top-spot ranking “international approval” for its efforts to serve public needs and improve meaningful access to data. The government made its pursuit of progress official in 2013 with the launch of a Chinese-language database for public documents. As of Dec. 15, you could pull 12,781 documents, for example an Atomic Energy Council research budget proposal that appeared on top of the stack this week. Last year officials found new impetus to offer more info as tens of thousands of protesters occupied parliament and the streets around it. 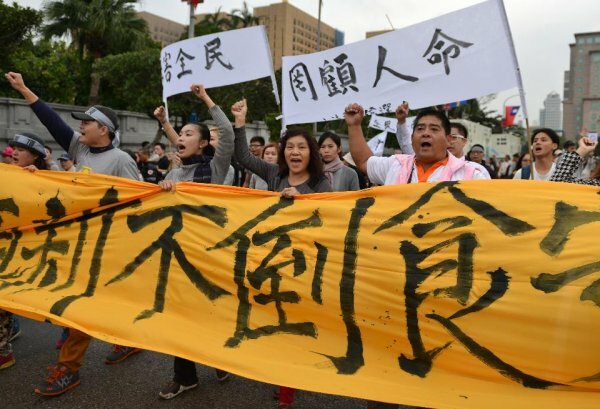 Demonstrators under the Sunflower Movement banner wanted more details on Taiwan’s fast-growing economic ties with China, a political rival of nearly 70 years, to ensure their side was safe from any takeover bid by Beijing. (China ranked No. 93 on the index with 18% of its data open, compared to Taiwan’s 78%, up from 67% last year.) “Taiwan has, of course, faced internal pressure to be more transparent in a number of ways including cross-Strait dealings,” says Alan Romberg, East Asia Program director with Washington think tank the Stimson Center. Taiwan beat other relatively liberal Asian governments, such as Japan and Singapore, by releasing more data on public procurement and baring election results at the poll-station level that’s “granular enough for the user community,” Open Knowledge International projects director Sander van der Waal says. But Taiwan, like Western countries, shouldn’t yet beat its chest in public. “Crucial data sets” such as postal codes, government spending details and land ownership records are still closed, the NGO says in a Dec. 9 statement.